1844 Beachside Tennis is a charming villa with spectacular views of the beach and Sound! The villa is located on the top floor of an elevator building and features 2 bedrooms, 2 baths, vaulted ceilings and multiple balconies. 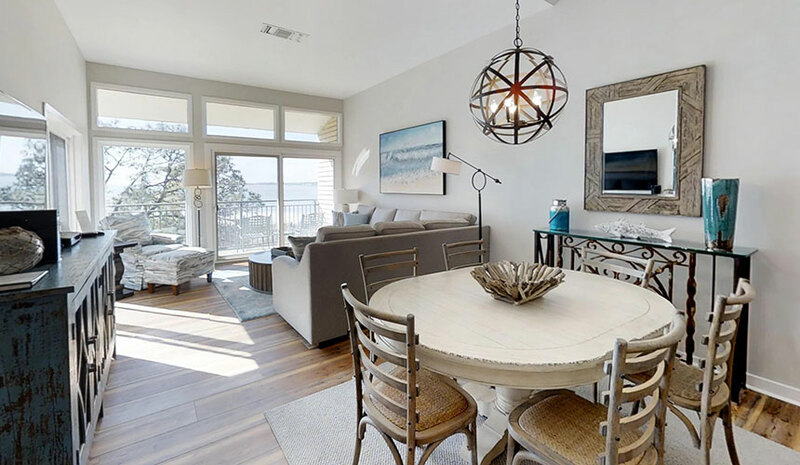 Beautiful updates and new furnishings make this top floor beachfront condo really shine! The master bedroom with King bed features a full bath with walk-in shower, balcony access and a water view. The guest bedroom has two queen beds and a private balcony. Both bedrooms have private baths and flat screen TVs. The living room has water views and a mounted flat screen TV. The dining room table seats 6 guests, and the adjacent kitchen has 3 additional bar stools. Wireless internet service is included and a large swimming pool is located onsite for guests of Beachside Tennis. Guests of 1844 Beachside Tennis can enjoy one free hour of tennis at the South Beach Racquet Club. South Beach in Sea Pines is one of the most sought-after areas on the Island. Surrounded by water, there is beauty at every turn. The quaint Cape-Cod style Marina Village is just steps away from Beachside Tennis and offers boutique shopping, dining and water activities like kayaking, fishing and dolphin tours. Rent a bike and enjoy miles of bike path and leisure trails in Sea Pines Resort. Read The Story Behind 1844 Beachside Tennis as shared by the owner of the home. Really great trip, the condo was beautiful and very clean we would definitely use Destination Vacation again. Thank you! I didn't select "exceeded expectations" b/c you guys always do a great job so I expect that anyway. Only complaint was that the blue ray player didn't work (we're tech savvy and tried 3 different blue ray DVDs but to no avail) - that was a shame b/c the hi-def/3D TV was terrific. Great condo, fantastic views, thoroughly enjoyed our stay as usual. Manager's Note: We apologize for the technical difficulties with the Blu-Ray player but it has been serviced and is fully operational. Thank you for letting us know!